Mims was reported missing June 8. The search was suspended on midnight June 11, but the crew of the Shiloh continued their search on board the vessel. The Japanese Coast Guard assisted in the search that combed more than 5,500 square miles of water off Japan. The circumstances surrounding Mims' disappearance are under investigation and no additional details about his recovery were provided by the Navy. Mims will be transferred to the USS Ronald Reagan for a medical evaluation, according to the service. 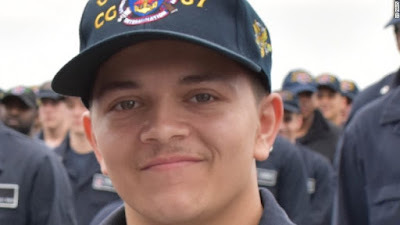 Washington (CNN)A US Navy sailor who was thought to have gone overboard seven days ago and was presumed dead has been found alive aboard the ship that reported him missing, the Navy announced Thursday. PACIFIC OCEAN (May 25, 2017) Gas Turbine Systems Technician (Mechanical) 3rd Class Peter Mims poses for a photo. Petty Officer Peter Mims, a gas turbine systems technician on the USS Shiloah Ticonderoga-class guided missile cruiser, vanished on June 8 while the Shiloh was conducting routine operations 180 miles east of Okinawa, Japan as part of the USS Ronald Reagan carrier strike group.